What Products Can Be Made From Recycled Plastic Bottles? Flammable liquids can catch something on fire even with just a tiny spark from static electricity. 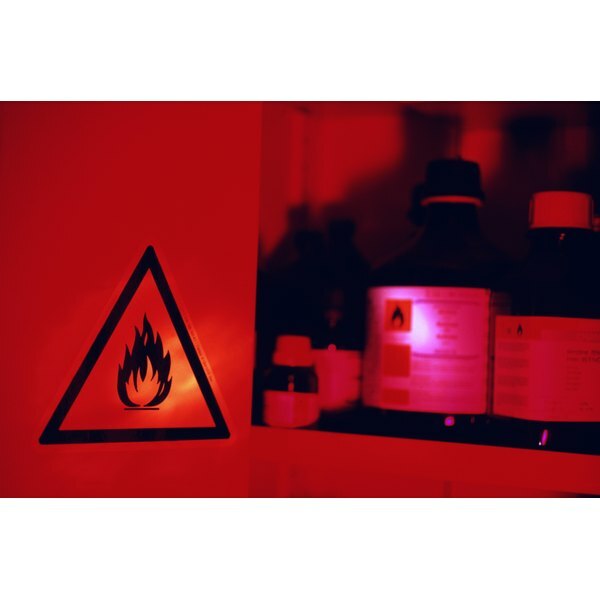 The proper way to dispose of flammable liquids is something every home and business owner should be aware of. Examples of flammable liquid products are laundry bleach, nitrate fertilizers, chemical solvents and pesticides. Storing the liquids properly is vital to the safety of those in our home and in public, but disposing of them properly is of grave importance to our environment as well. Avoid pouring flammable liquids down your drains. Use the proper storage containers and make sure they are closed according to the Environment, Health and Safety Today website. Contact local officials to locate waste disposal and collection facilities. They will be able to tell you the closest locations to your home or business. Look under the blue pages in your local telephone directory to find government agencies that can inform you of the laws and regulations in your jurisdiction. Try your city's waste disposal department first. Label all containers with flammable liquids. This will warn anyone nearby not to smoke or ignite a spark. Keep these containers in a safe location until they can be disposed of. Make sure they do not block fire exits or stairwells. Use caution when transporting any containers with hazardous liquids to the closest hazardous collection center. Take used or leftover antifreeze to a hazardous waste center or to an automotive center that recycles and regenerates the liquid. Recycle the motor oil when you change the oil in your vehicle. It can be refined for other products or recycled. A single can of motor oil can contaminate 1 million gallons of water, if it is disposed of in the wrong manner, according to the earth911.com website.